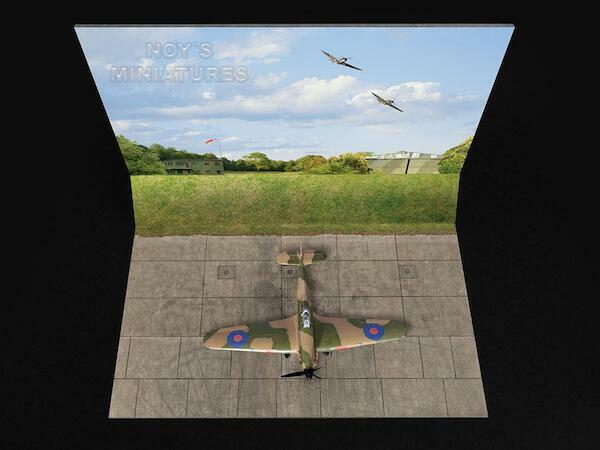 This version includes 3 sheets: The first sheet depicts the concrete surface upon which the fighter parks; the second is a backdrop sheet depicting a brick revetment with the airfield view and a Spitfire Mk.I and a Hurricane Mk.I approaching in the summer sky above. The third print is an additional BONUS free of charge component that enables the modeller to create the grass wall in 3D. Three 1/72 sheets (approx. dimensions of base and backdrop: Length: 31 cm / 12.2 inch; Width: 22 cm / 8.66 inch).